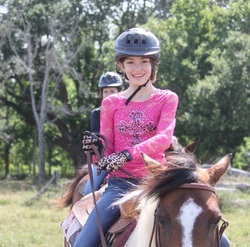 The Premier Horseback Riding Summer Camp for the Houston, Sugarland, Alvin, and Pearland Areas!! We are not a day care. A working ranch teaching responsibility while having fun. We ride horses and that is all we do. CALL FOR ADDITIONAL CAMP DATES!!!! Reserve early dates fill quickly!! Scroll to the bottom of the page for sign up instructions!!! Unlike many summer horse camps in the Houston, Pearland, & Alvin areas, Sundance Horse Ranch goal is not to entertain and babysit your children. No horse coloring books, no movies, No a/c as provided at many horseback riding summer camps. We teach responsibility through horsemanship. Learning respect and ethics while horse back riding and caring for our horses, cows, chickens, dogs and cats. We spend a portion of the day with the farm animals then riding our horses. The children are responsible for grooming, saddling, bridling, bathing, feeding and Hoof care of the horse assigned to them!!! Our Charly Grace the baby CALF is all grown up however the calves have been weened and will need to be fed each day during our camps. We are restocking our chicken pen and will have young chickens to care for along with RIDING HORSES EVERY DAY!!! The Sundance Ranch Horseback riding summer camp is located in Manvel, just a few miles from Pearland, Alvin, and Houston and takes place on an actual working ranch. Situated in the middle of our 150 acre ranch are our stables, where riders from all around Houston ride and board their horses. 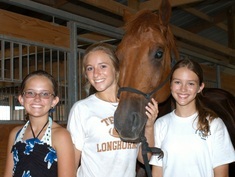 Your children will spend their time with our dedicated and expert staff members and ride actual working ranch horses. We offer lesson horses that have been selected for their gentle personalities. Our lesson horses can accommodate riders with varying degrees of ages and experience levels. 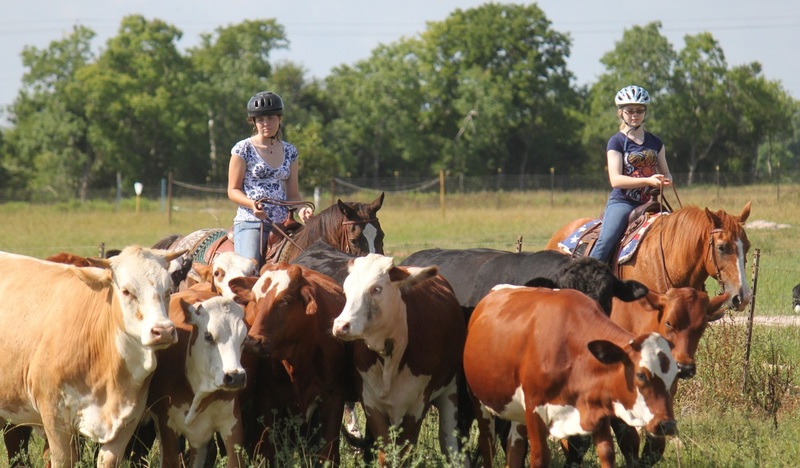 What Makes our Summer Horse Camp Different? Our Facilities No horseback riding around in circles in a small arena to the sound of city traffic. Our Summer Horse Camp is nestled amongst hundreds of acres of woods, with miles of trails, lakes, streams, and wildlife. games on horseback, and if qualified, they may work with cattle, run the barrel pattern, jump, or run the obstacle course. Wednesday and Thursdays On Wednesday's students paint and decorate their horses and we take our official pictures which we will prepare for them to take home with them. Thursdays we will give out the memento's and finish the tee shirts decorating to highlight there stay here at the ranch. We hope they will continue on there journey learning responsibility through horsemanship!!! Parents are invited to come any time and see what the children have learned!!! Pictures are encouraged!!! Safety Our unsurpassed student to instructor ratio, combined with a unique blend of horses for all horseback riding skill levels has enabled us to achieve an excellent safety record. Each horseback riding student is evaluated directly by the summer camp director Dorothy Wynne who considers their age, skill level, experience, confidence, and size to determining the appropriate horse. 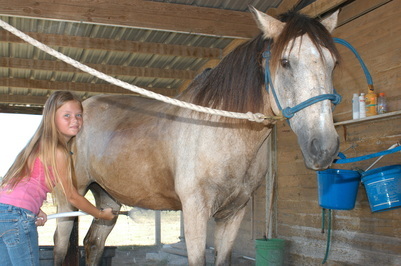 The horse that is paired with your child will be his/her own horse for the entire week of the camp! Camps fill early! Please see our Calendar of Events or call for available dates. PLEASE REGISTER EARLY FOR THE BEST AVAILABLE DATES!!!! When registering multiple children, please call us at least 30 days in advance to check availability. Note: Deposits are non-refundable. Balance paid upon arrival to camp. Campers should bring a refillable water bottle wear long pants and boots with a heel.